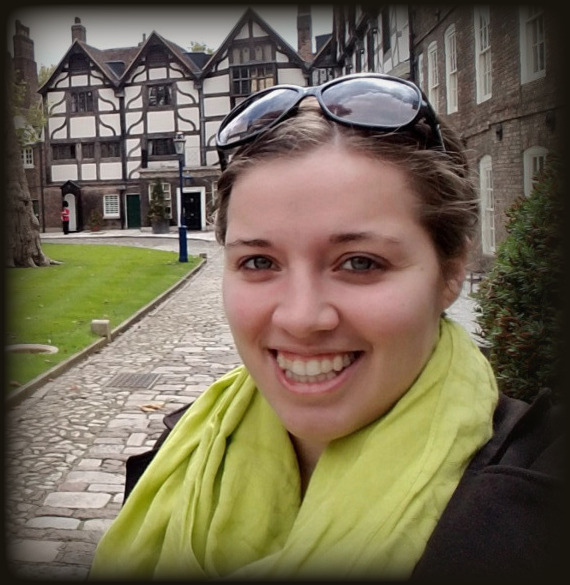 Hi everyone, I'm back for the moment! I hope you're all having a great June. I have been studying for the exam as you know but because my sister is tying the knot in September I had to split some time preparing for her bridal shower. 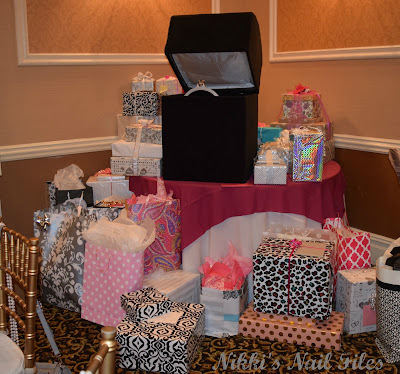 This post is quick loooooong recap of the Bridal Shower so keep reading if you're interested in some festive photos and bridal shower ideas. My mom, the two bridesmaids, the groom's mom, and I all planned the shower together. We limited the shower to about 50 attendees (the groom's family is quite extensive though) and we chose to plan a brunch at a beautiful ballroom in a local restaurant. 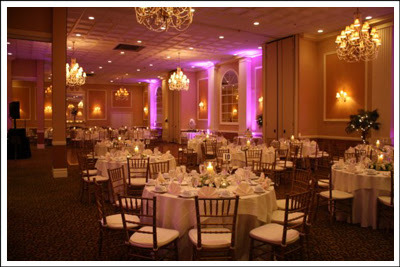 The photo is the full banquet room but they had wall dividers to break it down into two smaller rooms. It was the perfect size! The theme for the shower was Breakfast at Tiffany's because my sister is a huge fan of Audrey Hepburn and her movies. 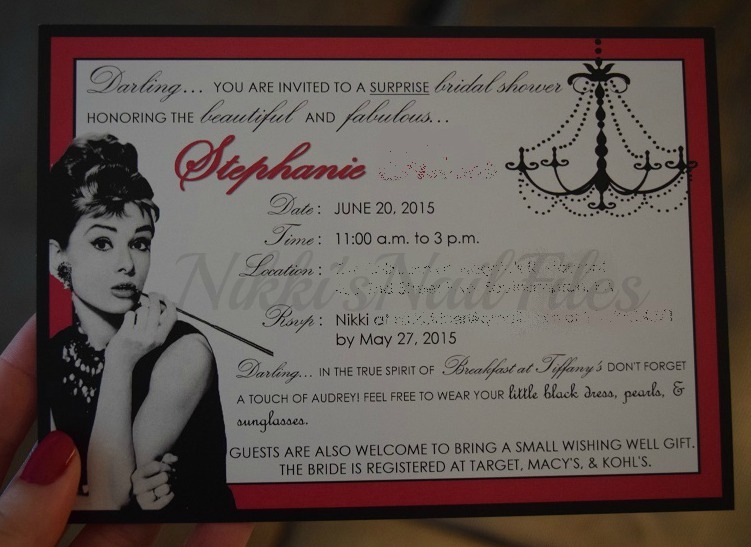 I custom designed invites perfect for the occasion and printed them using a company I found online. 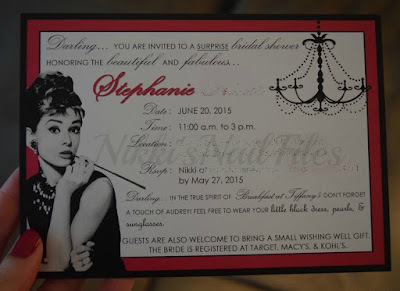 The invites turned out perfectly AND for less than $1 each they weren't expensive at all! 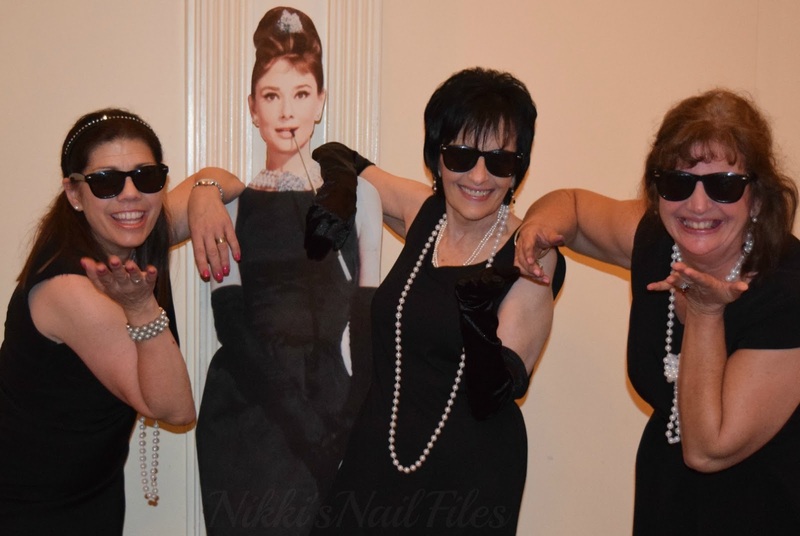 All the bridesmaids loved the design and how it invited guests to wear those little black dresses that everyone loves so much. I also DIYed a cute banner to hang on the fireplace mantel in the ballroom. I found the original idea on Pinterest but changed the font, size, colors, ribbons, and hearts to fit my sister's bridal shower. Ignore all my studying notes behind the banner...you know I'm studying! For treats, we of course had a bridal shower cake. 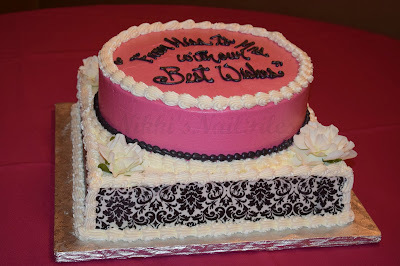 We chose pink because we knew she was thinking of raspberry for the wedding and the black and white is just so classic. She loved the cake and it was so delicious. The message on it read "From Miss to Mrs with our Best Wishes." We also decided to add a sweets tray so we found this adorable dual layer serving platter at Target on clearance for $17. We even managed to buy it secretly while at Target with Steph! She had no idea. Anyway, the treats we served were full size macarons from Miel Patisserie (one of Steph's favorite bakeries in Philadelphia), petit fores, and an assortment of cookies. Watching someone open presents can be really boring so to give guests something to do while Steph opened present after present after present (we really showered her with love), I designed and printed a Bridal Bingo game and a Bridal Word Search. The word search was made using an online generator (use words like marriage, bride, love, etc). 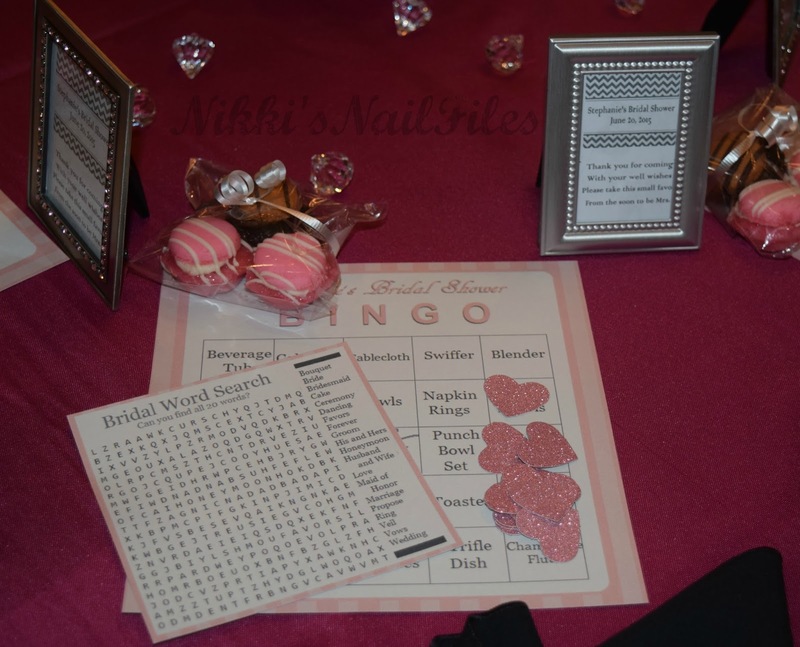 The Bridal Bingo was basically a standard bingo card but instead of the numbers I used terms like towels, silverware, keurig, wine glass, etc. and instead of bingo chips I used really cute pink glitter hearts punched from scrapbook paper. We played the standard bingo games (4 corners, straight across, etc) but we also added a "T" game where the winner had to cover the whole top row and the middle column (hence the "T"). People loved it! Winners were given little prizes throughout the shower and the guests got really into it the closer they came to covering their card. 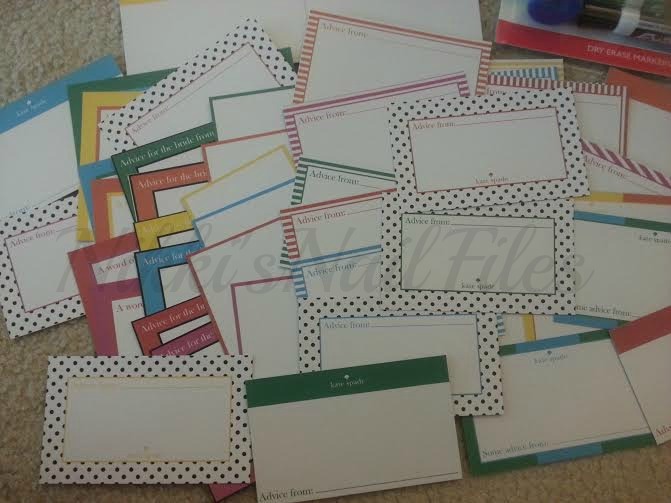 I also DIYed some Kate Spade inspired advice cards for guests to fill out for the bride-to-be. I collected them all and put them in a book before giving it to Steph. Now for the favors. In addition to the little frames, we also decided to give an edible treat too. 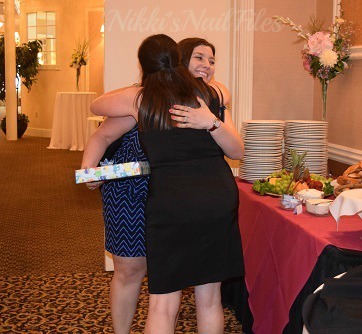 There was no shortage of sweets at this shower. 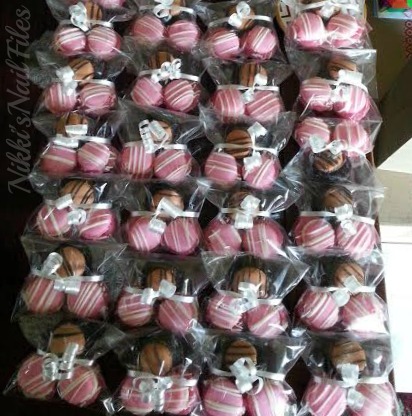 We packaged 3 Baked By Melissa cupcarons tied with a ribbon as a second favor for everyone. If you don't know Baked By Melissa it's my sister's favorite bakery in New York and they specialize in mini cupcakes. The cupcarons were a limited edition summer special that was only available until June 20th. They were the perfect combination of macarons (Steph's favorites) and mini cupcakes from her favorite bakery! Steph loved them! To keep with the theme, the wishing well for the shower was a custom designed wishing well made to look like a ring box. My dad made it so it could fit on a table rather than sit on the floor and it turned out amazingly. Everyone was complimenting it. Check out how generous everyone was! And the ring box was full of small goodies too. All in all Steph loved it and said it was the perfect shower! My Brother is a Graduate!